Don't worry, I'm not contributing to the incessant Internet ranting. I'm not ripping anyone to shreds here. I won't be telling you who I voted for, and I won't tell you which party I affiliate with. I'm tired of the intense wave of negativity flooding social media. 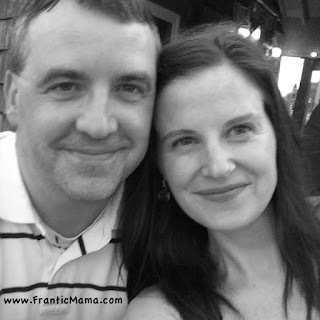 Anyway, when I met my husband back in college, we found ourselves on very opposite sides of the political spectrum. You would think our relationship was doomed from the start, but it wasn't. We've now been married for 9 years, and together for 15. We still disagree about certain political decisions, especially when it comes to social issues and constitutional amendments. But do we fight like cats and dogs, and "hate" each other for holding opposing views? No. During and after the recent election, I've thought a lot about how politics impacts our relationship and here's what I've decided: while it would certainly be easier to agree on everything on the ballot, we wouldn't have learned or grown nearly as much as we have over the past decade or so if we did. Being forced to snuggle up on the couch with someone who on the surface appears to have completely different political views forces you to ask questions and learn-- and most important-- listen. There is so little listening going on in the world. I think my husband is smart and educated, and hopefully he thinks the same of me. Seeing an intelligent person who you love in action, defending their views, makes you think much harder. It humanizes the 'other side,' and it also makes us look at ways to support our own beliefs or perhaps even question them. Something I think would do us all some good. More than anything, I think what helps us stay relatively afloat is that underneath it all, my husband and I do share the same priorities and values-- the value of family and hard work, the importance of keeping people safe, and the necessity of a good education-- we just sometimes think different paths will get us there. Plus, a roomful of interesting people who all agree with each other can quickly spiral into a roomful of holier-than-thou know-it-alls. No thanks. Politics won't be wrecking my marriage anytime soon. Our situation has made me more open-minded and less judgmental. I hope my husband feels the same way. Politics shouldn't be based on constantly trying to change someone's mind to agree with you; to me, it's about opening up our own minds. My marriage has made me look at things through more than one lens, and I feel lucky for that opportunity. And underlying and despite all of it, I can always admire how passionate my husband is in his beliefs. Hopefully we can continue to weather life's storms. How about you? 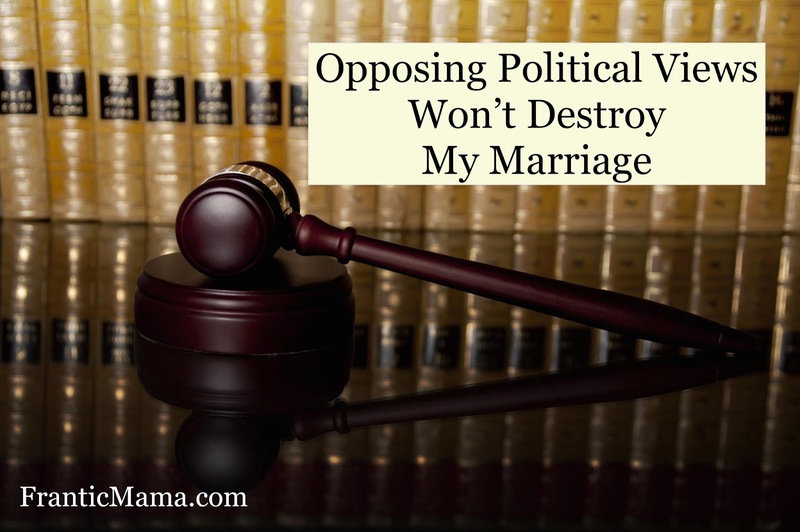 Do you and your spouse agree politically? If not, how does it affect you? 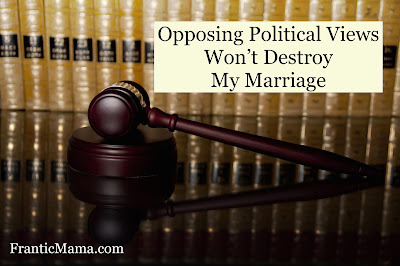 My husband and I don't always agree politically, and yet we are close enough that it doesn't impact our marriage. And just like you, our core values are the same. 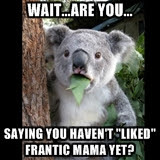 I'm sure this past week may have tested a lot of marriages! Yes, I bet you are right! We got through it okay, but it was definitely a highly charged election season. Thank you for your note :). Politically , I couldn't say much , our elections are nowhere near. But it is the kids' bedtime for us! I want them in bed at eight and my husband thinks an hour later is okay too. I am already too tired by that time, and would snap at times. Yet , I have lately realised that he likes talking with and listening to the boys after coming back from work which is usually at about half past seven. So I have handed over bedtime to him and we have turned a disagreement into a free hour for me!! What a perfect solution for your family! Bedtime at a decent hour is a priority for me too. My kids go to bed pretty early, and I think it's for two reasons: they need to and I need them to. Then my husband and I have a little time together before we go to sleep. I treasure that time!